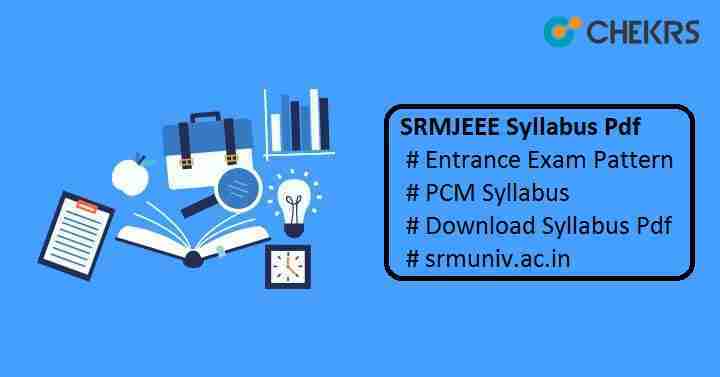 SRMJEEE Syllabus 2019 Pdf: Candidates who are thinking to apply for SRMJEEE 2019 are suggested to go through the complete syllabus before the exam to score well and to excel the exam easily. The syllabus will of intermediate level, so who have already studied the class 11 & 12 subjects can easily score good marks in the exam. If you will select the course, Biomedical and Genetic Engineering then you will have to study Biology instead of Mathematics. Here we have provided the SRMJEEE PCM Topics, check it. Chemical Bonding, Molecular structure and s- and p- block elements. It is very important to know the exam pattern before the exam as it will give an idea about the marking scheme, time duration to complete the paper, no of question per subjects, weightage of each subjects etc. To know the SRMJEEE Exam Pattern, candidates can check the previous year papers and also give online mock test. Hope this article will be helpful for you all. For any query related to SRMJEEE 2019 Syllabus and its exam pattern, you may ask in the below comment section. We will help you for sure. Wishing you all the best!! !